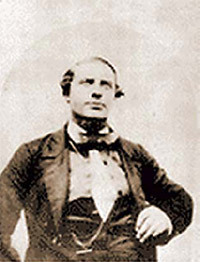 Adam Horne was the first non-native to visit Horne Lake in 1855. The lake was known at that time as Enoksasant Lake. It was renamed Horne Lake four years later by Captain Richards of the hydrographic ship H.M.S. Plumper. In the early 1900's the E & N Railway gave Robert Dunsmuir the lands around Horne Lake. Dunsmuir originally had plans to make the lake and surrounding country a private game reserve. By the 1920's Horne Lake's great stands of timber were discovered and several logging companies began to work the area. The largest of the logging companies was Thompson and Clarke, based out of Seattle. Access to the lake was poor and not suitable for trucks. Thompson and Clarke applied to the provincial government for financial assistance to improve a wagon trail from Dunsmuir to the lake. The government completed the work and under budget for a cost of $992.15 and charged Thompson and Clarke for a portion of the costs. Thompson and Clarke also requested permission to build a railway along the north shore of the lake to haul the timber to Deep Bay through the Big Horne Valley along Rosewall Creek. After receiving permission Thompson and Clarke built over 17 miles of rail. 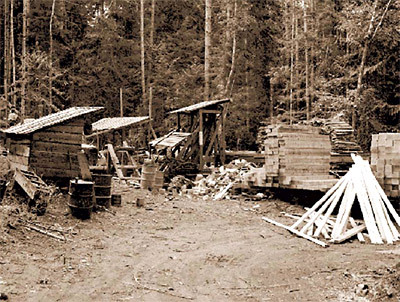 Seven logging companies built logging camps surrounding Horne Lake. The largest camp was located at Camp 5 at the west end of the lake. 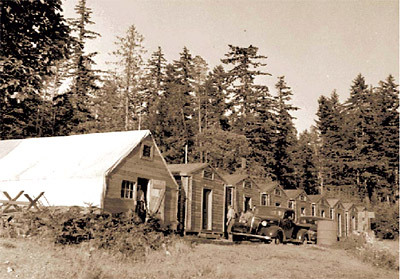 At its peak the camp was comprised of a cookhouse which fed 450 men, 50 bunk houses, 10 family houses, a school, a store, a sawmill, and a machine shop equipped to build a locomotive. The location of Camp 5 is the present Regional District of Nanaimo Horne Lake Park. Camp 7 was a Japanese camp. The Japanese were also the section crew which built all the rail tracks around the lake. It was during this era that people started to discover Horne Lake for its recreation opportunities. The logging opened access to the lake and the families and friends of the loggers started to build cabins along the shores of the lake. Road access during this period terminated at the Bay. For the price of $2 a ride could be purchased from the Horne Lake garage to Horne Lake in a model T and another $2 purchased a ride on a tugboat named Jiggs to places further along the lake. Another option was by speeder along the rails from Deep Bay but was not popular due to the fact that it was a 'very cold ride'. The first resident of Horne Lake was McCormick who received permission from the logging company at the time to locate a residential cabin on its shores. McCormick dragged a small loggers cabin down the shore and floated it across the water. During the 1930s more people followed McCormicks example and began squatting, setting up their cabins on the quiet lake. Over the years more people became aware the spectacular scenery and crystal waters of Horne Lake and increased numbers built cabins on the Horne Lake banks. Recent research into the history of Horne Lake has discovered that the first resident of the area may have been a sasquatch. The first reported sasquatch sighting occurred in the year 1904. The Victoria Colonist reported on December 14, 1904 that four hunters saw a 'hairy wild man with long matted hair and a beard' racing at 'tremendous speed' through 'unimpentrable undergrowth'. A number of other sightings took place over the next few years but there have not been any reported sightings over the past number of decades. The lands surrounding Horne Lake have had many owners. For a time, the lands were owned by B.C. Cement, who according to the locals, had planned to mine the limestone cliffs of Mt. Mark. They eventually abandoned the idea and concentrated their efforts on Texada Island. The land was purchased by Montague Drake in 1962 and subsequently purchased by Prince Johannes von Thurn und Taxis. Taxis, who at the age of 64, was said to be Germany's second richest man, with world wide assets exceeding 2.5 billion U.S.
After unsuccessfully trying to move the cabin owners in 1962, the Prince Taxis agreed to lease the land to the cabin owners on five year renewable terms. The first leases went for $250 per year. When he died in 1990, his wife, Princess Gloria, inherited the land, and managed her Horne Lake holdings through her B.C. company called Texada Logging. The princess continued his father's agreement of licensing lakefront lots to cabin owners on Horne Lake, with Texada logging handling the arrangements. In November of 1999 the German princess sold Horne Lake lands to MacDonald Development Corporation. The princess' family fortune, crippled by estate taxes and poor investments, had dwindled to about five hundred million US, so she decided to sell off her worldwide assets. 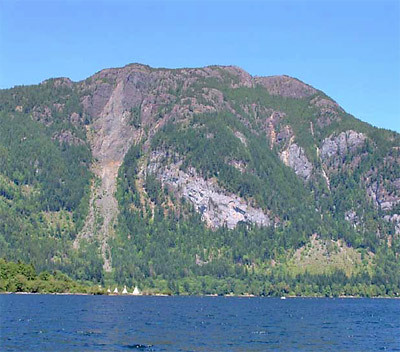 MacDonald's company purchased 4, 816 hectares on Saltspring Island and Horne Lake. The Horne Lake License Holders Association (HLLHA) negotiated with MacDonald Corporation to purchase the lands surrounding Horne Lake. The HLLHA's goals were to provide future security to its members and to preserve the natural beauty of the area. HLLHA, in seeking to purchase the lands, have sought appropriate zoning from the Nanaimo Regional District and various government agencies, which included The Ministry of the Environment, The Ministry of Lands and Forests, and the Ministry of Fisheries. The process involved opportunities for community input from a wide range of groups and individuals. Horne Lake Park was transferred by the membership to the Nanaimo Regional District for community and public use. The Horne Lake Voluntary Board of Directors and Project Manager Murray Hamilton provided leadership and dedicated service to the membership in successfully completing the purchase and approval process. On January 23, 2002, the historic agreement was signed by the Board which created a new era for Horne Lake.